Introducing StudioDuke, a virtual creative lab providing Duke students the opportunity to take their artistic projects to the next level of awesome. Here’s how it works: StudioDuke will announce an open submission call for student works. Submissions can be in any area of creative endeavor, including screenplays, fine arts, digital media, manuscripts, stage plays, choreography, comedy, short/feature films of various genres (including animation), and music compositions or performances. Submissions will be reviewed by the StudioDuke team to be selected as part of a StudioDuke cohort. Selected projects can be pursued by students as an independent study, an experiential component of the Innovation & Entrepreneurship Certificate, or for no academic credit whatsoever. A panel of professional mentors selected for their achievements in the creative industries will work with students accepted into StudioDuke. The goal is to bring each project to the point where it is ready to be pitched to industry professionals. The StudioDuke team will facilitate the connections, travel resources, and logistics to support the project. 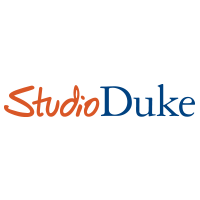 StudioDuke is a collaboration between Duke I&E, Duke Arts and DEMAN, and is possible thanks to a generous gift from Clifford Chanler (T’82). Duke students with commercial aspirations for their creative projects now have a direct pipeline to the arts and entertainment industries.